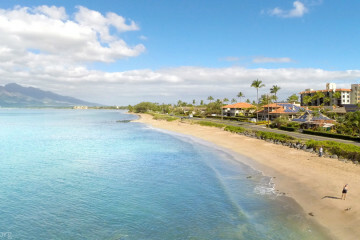 Here are some of our favorite Panoramic Photos of Ka’anapali, west Maui, Hawaii. Jumping off of Black Rock is a pretty popular activity. Each evening there’s a torch lighting ceremony where the lighter jumps off at sunset. Just 10-15 minutes north of Ka’anapali is a world famous spot with occasion great waves in the winter and great snorkeling the rest of the time. Maui golf courses are world-renowned and many of them are located on the upper west side. The boardwalk along Kaanapali Beach is a perfect spot to enjoy the sunset over the ocean. We love this shot taken by Maui Stand Up Paddle Boarding. Can you see them in the water on the lower left? We’ve taken this same photo at least 10 times! A rainbow loves living in this spot. The west side is just amazing. It’s rare to get rainy, ugly days over there. You can’t beat the view from the Sheraton Ka’anapali swimming pool along Ka’anapali beach. This double rainbow arrived just after a wedding in the rain at Kapalua Bay. It wasn’t coming down hard, but it made for a fun ceremony. On the north end of Kaanapali Beach you’ll find the famous Black Rock. Snorkeling can be great in this area. Beautiful Just like I remember it.